A tendon is a fibrous tissue whose role is to connect muscle to bone. The patellar tendon is a thick and extremely strong fibrous structure which extends from the lower tip of the kneecap (patella bone) to the tibial tuberosity, and connects the kneecap to the shin bone. A patellar tendinitis is defined as an inflammation of the tendon, usually due to the practice of impact sports that require a lot of running or jumping, such as the high jump, basketball, volleyball, handball, soccer, etc. Indeed, the inflammation settles when a loading stress is repeatedly placed on the patellar tendon, especially if the intensity or frequency of a training regimen or activity is suddenly increased. The main symptom is pain in the area just below the kneecap. Initially, the pain will only be present as you begin physical activity or just after an intense workout (it is then advisable to stop the sport causing this pain in order not to further worsen the condition). Then, depending on the level of pathology, the pain will eventually interfere with daily activities such as climbing or descending stairs or getting up from a chair. If the condition further progresses, the pain will also be present at rest, especially if resting in a seated position. Other symptoms might include swelling and a patellar tendon sensitive to touch. Firstly, physiotherapy treatments will aim to reduce the pain and inflammation present with the use of electrotherapy (such as ultrasound or TENS), ice and proper education regarding the activities that may worsen your condition and thus that should be avoided for the time being. Then, your therapist will use a wide array of manual therapy and muscle relaxation techniques, and will prescribe effective stretching and muscle strengthening exercises for the leg muscles. 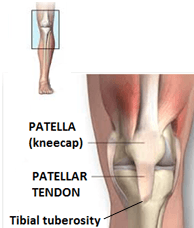 A patellar tendinitis left untreated can lead to a partial tear, or if severe, a complete tear of the patellar tendon. 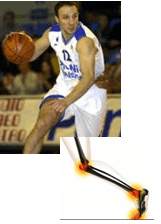 Therefore, please consult a Forcemedic physiotherapist as soon as possible for a quick recovery!